Appearance (0-20): Pushing through a bargain bin I found a bold and elegant gold and black label staring back at me, buried beneath all of the crap. What’s this? A big 6.5”x 62 sitting in the 2 for $7 bin? Not waiting to find out of there was some kind of mistake, I snatched the only two of them up. 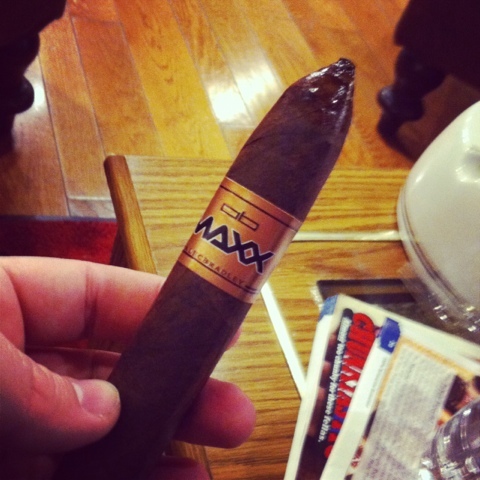 The outer shape looked interesting since it is such a large cigar with a box press applied to it. Very classy. The wrapper is somewhat dark and a little oily and there aren’t any blemishes to bark at. About the only complaint is there are a multitude of small veins along it. Construction (0-20): The shape of this has me really wondering if this was one of the first of the “Vice Press” cigars that Alec was experimenting with (Note: newer vice press ones actually say Vice Press on the band). My confidence is partially shaken on the wrap as it’s a little looser than I would like, but it’s still easily smokeable just with the draw being a little looser than usual. This thing absolutely billowed smoke too, which I was extremely impressed by. However, the loose nature kept this from keeping its ash for too long. So the shape was neat for such a big cigar, and it was packed well on the inside… but the looser wrapper might be detrimental. Strength (0-20): I’ve got to drop this into the medium bodied range. It doesn’t hit you like a ton of bricks but it also isn’t a Sunday morning with coffee kind of smoke. It begins closer to the full range, but by the end I found it closer to the mild range. It’s interesting that throughout the smoke it seemed to regress in power slowly. Hmm. Flavor (0-20): Balanced is the best word I can think of here... Wood and leather notes that mix with some hints of cinnamon and chocolate tantalize the taste buds. From time to time you will find a little coffee that wants to say hello. The whole thing is really delicious smelling while the smoke is pouring out. Simply put – there are very good flavors that vary throughout the entirety of it. Its not overly complex, but nor is it completely simplistic. Well played. Value (0-20): For the MSRP, it’s more pricey than its worth… yet it isn’t utterly terrible considering some things I have smoked in the same range. Mind you, if I was to rate it based on what I actually paid ($3.50) it would indeed be a bargain. Unfortunately the MSRP rules here. Additional Notes: Paired with Gurkha coffee at Cigars International. Yes, Gurkha makes coffee, in case you didn’t know. Hmm, perhaps it’s a time to review their coffee? Overall (0-100): Nice flavors to the cigar, with a unique blend of a huge sized cigar that’s box pressed. However there are some glaring issues – pricepoint, the drop in strength, and construction. Personally I will likely try the newer Vice Press from Alec at some point just so I can make an assessment if he learned from doing the process for a few years now. That being said, I wouldn’t give a glowing recommendation on this one, but I do think it’s worth a smoke… especially if you can find it for a bargain price.